Check Our Ready-to-Go Staircases Today! Sometimes, the biggest obstacles people see with getting a new staircase is the installation itself. Many people feel that it can be time-consuming, costly, and a process in and of itself. Acadia Stairs created ready-to-go staircases to help homeowners get the customized staircase of their dreams within their budget. How do our ready-to-go staircases work exactly? Well, essentially, what we did was a create a ‘Do It Yourself’ spiral staircase, that anyone can set up to accommodate their property needs. Like the name states, these kits come ready to go, and assembly is minimal. And the best part is their flexibility—the components allow anyone to adjust the staircases accordingly to fit the size of the space. 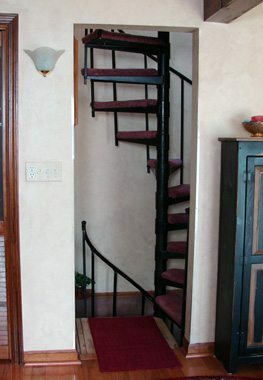 Currently, the spiral stairs are available in 4’-0” and 5’-0” diameters, which offer customers wide opportunity to build upon their space. Because they’re spiral, the kit stairs can rotate clockwise, or counter clockwise, to fit whatever the space demands. No matter the height—whether a few steps, or a taller climb—the staircase can be adjusted to make it happen. We specifically chose a spiral staircase design for our Ready-to-Go kits for those very reasons: they look great; they require less space, which is often hard to come by; and they’re extremely customizable. If you want a landing as a sort of intermission between steps, that’s doable! As is a few steps to another doorway a higher grade up. The key to the Ready-to-Go kits — and this goes for all our products — is collaboration. By letting us know the specs of your space, we’ll be able to design a set-up staircase that is perfect for what you’re looking for. That way, you have a staircase that is not only of utility, but also, one you’re proud of. Contact us today to learn more!